BlackFish or Black Eye… – You Betcha Can Make This! The conversation regarding the documentary film BlackFish seems to be swirling again fueled by a protest over a Sea World float that was part of this year’s Tournament of Roses Parade. I saw the documentary a few month’s ago when it was shown on CNN and I have to admit after I saw it I was very disturbed. And this is quite an admission coming from me, as this was the girl who for year’s said that it was her biggest dream to jump into the tank with Shamu and be a Sea World animal trainer! At the heart of the documentary is the story of the Orca called Tilikum. He was snatched from the sea when he was two years old and has lived in captivity ever since. His treatment over the years, and specifically in the early years, was horrific and no doubt affected his behavior. 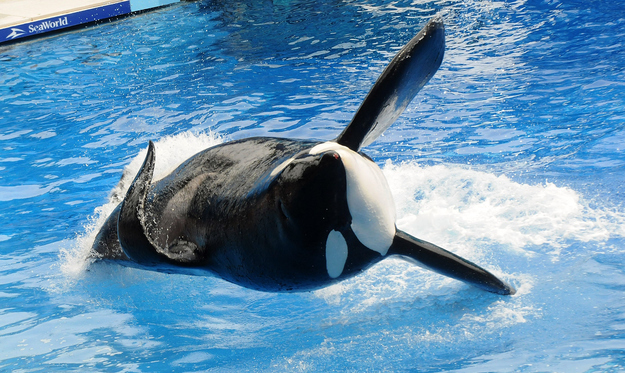 He has killed three humans over the course of his life in captivity but the more recent death of Dawn Brancheau, a highly skilled Sea World trainer, has driven to the forefront his unfortunate saga fueling the public debate regarding Orcas in captivity. The concept of captivity has a negative connotation, the idea of removing a species from its natural environment and keeping it “prisoner” in a fabricated world. And to some degree I cannot argue that point. But I think you need to dig a little deeper to form an opinion on the “appropriateness” of these fabricated environments we call zoos and aquariums, even those that are for-profit like Sea World. As a child and as an adult I’ve appreciated both. These venues provided knowledge that created a deep love in me of all creatures great and small. Over the years I’ve seen them transform from rows and rows of cages and tanks to sprawling areas designed to recreate to the best degree possible the animal’s natural habitat while also becoming increasingly concerned with the welfare and healthy stimulation of the animal as well as providing a venue for public education. I may have never been able to see the splendor of an Orca if I had not gone to Sea World. It is a majestic animal and having had the opportunity to see it only fueled my desire to support increased conservation efforts. That passion was initially created by seeing a majestic animal living in a prefabricated world. Good for me, not so good for the Orca. So at any given point in time I can see both pros and cons to this argument. Should these institutions even exist? In a perfect world would we need them? Probably not. But this is not a perfect world. What is right and what is wrong is not as simply defined as the black and white color of the Orca. What I think upsets me the most is the relentless drive of some organizations to influence public opinion without providing a complete picture of the issue. Yes, it is unnatural for these animals to be living in these environments. Yes, wouldn’t it be great if they could all live in their natural habitat in a world that would respect them an allow them to flourish. But let’s get a foot in reality here. It is not a perfect world and these majestic wild creatures, not just the Orca alone, are in major danger of becoming extinct because man, who has put them in captivity, is also poaching the life out of them for profit. The African Elephant alone is in real danger of extinction because of the market for ivory. Our grandchildren may never be able to see a rhinoceros as they are being killed off in droves for their horns. And the stories of these animals can go on and on. In my mind there is no doubt that the root cause of the problem is man, and unless we can make some serious changes to our species others species may cease to exist and a lot sooner than we would like. So let’s have that be at the basis of this discussion. Animals should be treated humanely whether in fabricated or natural environments, and if we can successfully deal with how they are treated in the wild, maybe our need for fabricated environments may not be as great. But until that day comes, if it ever comes, I think we need to figure out a happy medium and have a well rounded instead of one-sided discussion. There is a real value to public education and seeing these animals up close and personal is an experience that cannot be replicated by a book or a film. Some of these institutions are actually increasing the numbers of rare species. And what about the efforts of some of these organizations to rehabilitate and release these animals back into the wild? I guess my point is that there is no easy answer here. But keep the discussion accurate by fulling examining all aspects of the issue. It’s unfortunate that the movie Blackfish did not examine the issue from both sides. Yes I know Sea World refused to participate in the film, and that is perhaps their fatal flaw. But the damning influence of Blackfish affects all institutions that care for these types of creatures and creates a public opinion that is not fully informed. I think it’s great we are having the conversation, but have the conversation based on all sides of the argument.